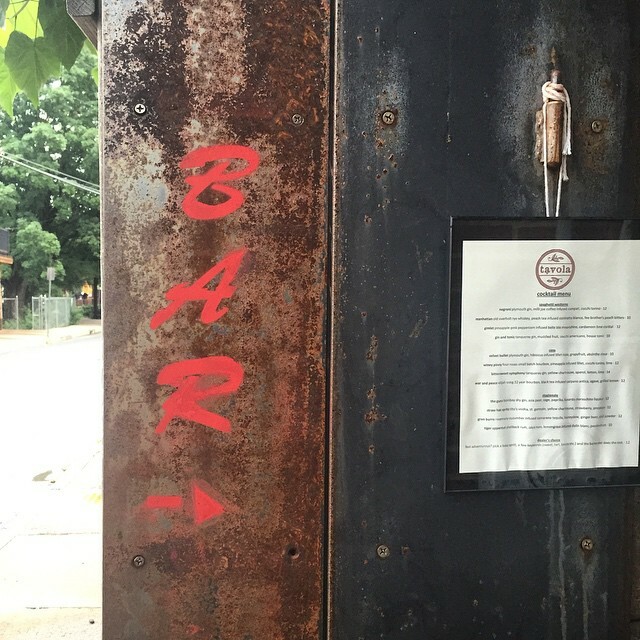 On the wooden fence to the left of Tavola, in bright red spray paint, is a single word, “BAR,” and an arrow pointing the way to one of Charlottesville’s newest dining spots. It’s a direction you’ll want to follow: at the end of the alleyway, tucked behind the restaurant, is Tavola’s cicchetti bar, boasting a small plates and cocktail menu perfect for the diner who likes to try a little bit of everything. 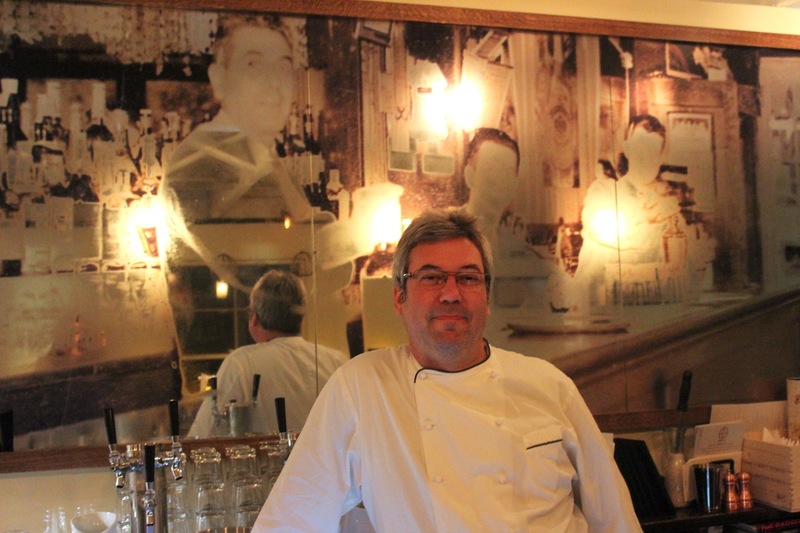 The cicchetti bar was originally created as a place for Tavola guests to begin their experience with a drink and a snack (“cicchetti” is Italian for “snack) while waiting for a table, says chef Michael Keaveny, who co-owns the restaurant with his wife, Tami. Tavola doesn’t take reservations for its cozy dining room, and many of us have probably waited on the Belmont sidewalk for a table to celebrate a milestone event, or just to enjoy a damn good meal. Now, Tavola customers can begin their dining experience in the bar, with a cocktail and/or an appetizer downstairs. But you don’t have to be waiting for a Tavola table to enjoy the cicchetti and craft cocktails. The bar is its own destination, and Cvillians hungry for something new can treat it as such. The room feels a little bit Italian, a little bit west coast. It’s more modern than Tavola’s rustic dining room, but it maintains a cozy feel with exposed beams, wooden tables, a variety of seating options, and a brilliant, glowing bar. The bar is at the heart of the operation. Run by bar manager Christian Johnston, it’s stocked with sparkling bottles of liquor, homemade syrups, vintage cocktail glasses and fresh garnishes. Johnston began his career in the kitchen; he wanted to be a chef, and served as sous chef at Zinc Bistro before turning his attention to craft cocktails. He tended bar at Mellow Mushroom and Blue Light Grill before moving on to The Alley Light and now, Tavola. Johnston’s chef’s palate likely has an impact on his bartending. He likes to consider the food menu when creating his cocktail list, and the cocktails pair well with the cicchetti. His drinks are well-balanced and interesting and totally satisfying on their own, if a cocktail is all you’re after. Keaveny and Johnston, along with a small bar staff, make the place cozy, friendly, and completely enjoyable. Apparently, hospitality is in Keaveny’s blood. His great-grandfather, Lodovecio Raucci, owned a bar and grill in Peabody, Mass. 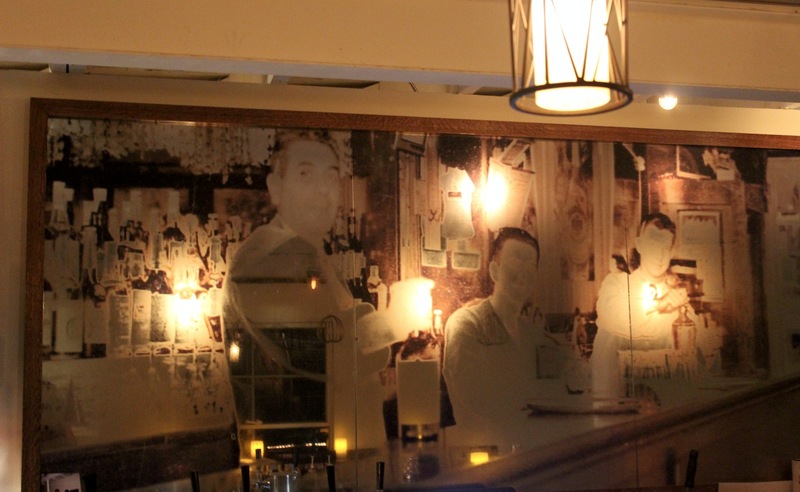 That’s Raucci, serving at his own eatery, in the photo printed on the large mirror mounted behind the sparkling bar. When the Cville Niche visited the cicchetti bar, we took seats at the edge of the bar and quickly felt at home. A few different groups came and went while we ate—some came in to wait for their Tavola tables, others came in for a drink after dinner at other restaurants. In addition to high stools at the bar, the room has tables of different heights and sizes to accommodate a variety of groups. It’s a great date spot, a good place to catch up with a small group of friends over good food and good drinks. The food makes me think of New England, of my upbringing in Boston and in Maine. The plates served were simple but flavorful—Keaveny’s cooking emphasizes the ingredients. He doesn’t disguise the food in sauces, and none of the ingredients compete for attention. Each plate was summery and refreshing, and each one tugged at my New England heart (especially the clams and the ricotta). The menu changes daily, depending on what ingredients become available. “It helps keep the cooking creative,” says Keaveny. With items like sheep’s ricotta from local creamery Twenty Paces and Ipswich clams (brought from Massachusetts), “if I can get ‘em, we’re gonna run ‘em,” says Keaveny. Like the cicchetti menu, the cocktail menu will also change with each season. The summer list, available now through late August/early September, is divided into four sections: “Spaghetti westerns,” (American classics with an Italian twist) “casa,” (house) “stagionale,” (seasonal) and a “dealer’s choice” section. The small plates and affordable cocktails afford a diner the ability to try many options from the menu. The seasonal changes will entice the diner to come back for more. Insalata di anguria: local watermelon with ricotta salata, aged balsamic and cress. The sweetness of the watermelon was perfectly but by the saltiness of the ricotta salata and the bitterness of the cress. Arancini: A stuffed rice ball, breaded and fried, of prosciutto, peas, mozzarella sitting in a tomato-basil butter. The breading is crispy and light, the risotto is soft, the sauce silky—each bite has great texture, bodacious flavor. Fried Ipswich clams: Clams pulled from the beaches of Ipswich, Mass., only two days before, with meyer lemon-caper aioli. I could have eaten a dozen of these. We had an odd number on our plate, and Linnea graciously let me have the extra bite. These are so simple, so perfect. A good clam doesn’t need a lot to taste good; the batter often overpowers the flavor of the clam, but Keaveny has treated them with such care that it’s not the case at all here. And that aioli is amazing. Ricotta: Salty, kite-shaped toasts smeared with Twenty Paces sheep ricotta and drizzled with local honey and chives was my unexpected favorite. The creamy cheese and honey combination makes me think of Maine. Flourless chocolate torte: Fudgy and rich. The dollop of orange cream on top is perfect against the bitterness of the dark chocolate. Gimlet—A “spaghetti western,” and completely delicious. The gimlet is one of my go-tos, and Johnston’s is my new favorite: pineapple-pink peppercorn infused belle isle moonshine, cardamom lime cordial. It’s a little bit tart, a little bit sweet, and very strong. Tiger Uppercut— From the “stagionale” section, Johnston says he named this tiki drink for a special attack move – a twisted punch thrown mid-jump—in the StreetFighter video game series. The drink certainly packs a summery punch: shellback rum, zaya rum, lemongrass infused dolin blanc, passionfruit. House-made limoncello (a lemon liqueur on the rocks); a glass from the first-ever Tavola batch was delicious. Go get some. You could even have this for dessert. War + Peace – Elijah Craig bourbon with a black tea-infused carpano antica, agave and a grilled lemon. This is what bartender Ramond Forthuber makes for me when I tell him I like bourbon and drinks that aren’t too sweet. We closed down the place, talking and laughing until our full bellies couldn’t take it any more. The bar closes around 10:30 p.m., but if you’re eating, drinking and enjoying yourself—which is easy to do at Tavola’s cicchetti bar—they won’t kick you out on the minute.